Super stylish ski goggles from Smith. 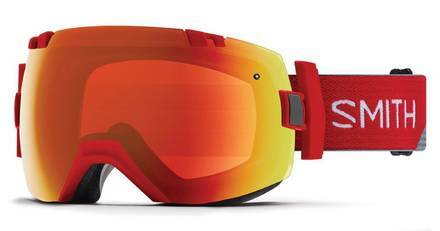 But style is not everything - with the I/OX Fire Split goggles your get an immense wide field of view. That is due to the large spherical lens (a lens curved both horizontally and vertically) and the frameless design. With these goggles come two lenses from Smith most advanced lens-series. The ChromaPop Everyday Red Mirror and ChromaPop Storm Rose Flash lenses. The ChromaPop technology gives you more detail over a wider range of light conditions. The ChromaPop Everyday Red Mirror is perfect for a huge variety of light conditions - from low light snowy days to bright sunny days and the ChromaPop Storm Rose Flash covers low light conditions like evening times and to partly cloudy days.